This topic describes how to deploy Cloud Functions using code that is version controlled in Cloud Source Repositories. By integrating Cloud Functions with Cloud Source Repositories, you can use Cloud Source Repositories to version control the code that contains your function. As the function changes over time, you can continue to access previous commits to see how the function changed and when. With your code stored in Cloud Source Repositories, your next step is to create and deploy it. You can perform these tasks either with the GCP Console or the Cloud SDK. 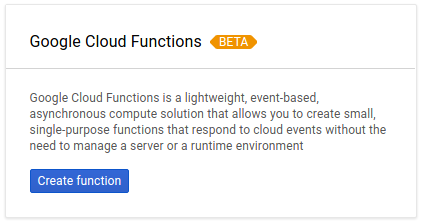 Go to Cloud Functions Overview page in the console. In the Name field, type a name for your Cloud Function. In the Source code field, select Cloud Source Repository. In the Repository field, type the name of your repository. From the Branch/Tag options, select the branch or tag that contains the version of the source code for your function. Then, in the next field, type the name of the branch or tag. In the Directory with Source Code field, type the path to where the function code exists in your repository. In the Function to Execute field, type the name of the function. While the function is being deployed, the icon next to it is a small spinner. After it finishes deploying, the spinner turns to a green check mark. From a terminal window, type the following command. Note that you must modify this command with the project ID, repository ID, and source path. With your function deployed, you can use either the GCP Console or the Cloud SDK to test it. Click the name of your function. The Function Details screen opens.